The Airmail Act of 1930 changed the way small air carries would carry out their business functions. The Airmail Act of 1930, created a new method on which the United States Postal Service awarded postal contracts. The act eliminating competitive bidding. The Act created a payment structure based on the weight of the load carried by the aircraft per mile rather than a flat rate per mile regardless of the weight of the load. Contracts were awarded based on aircraft payload. Companies that had large aircraft were more likely to be awarded contracts rather than those companies with smaller aircraft. This Act encouraged airline carriers to purchase large aircraft and in many cases brought about the merger of smaller air carriers. TWA was one of many air carriers that came about result of the Airmail Act of 1930. In 1930, Western Air Express and Transcontinental Air Transport were merged to form the air carrier TWA. By the mid 1930's, TWA was providing cargo and passenger service from coast to cost in the DC-3 aircraft in under 36 hours. Many of these aircraft had sleeper berths install for added passenger comfort. TWA had also added flight attendants "air hostesses". This is a result of the success that the Boeing Air Transport company (BAT) had on their flights with flight attendants. Originally, these flight attendants or stewardesses were nurses by profession, these nurses were paid by the air carrier to assist passengers on their flights with any medical needs that they may have such as air sickness. These nurses would as well comfort passengers by handing out blankets, pillows, etc. This was an added feature that significantly increased TWA's mark share in air passenger service. By 1939, Howard Hughes had acquired controlling interest in TWA. That is 75 percent or over 80 million dollars. TWA's growth began to grow significantly due to the popularity of Howard Hughes. Because of Howard Hughes influence, TWA was in a position to obtain the better international and domestic air routes. TWA's postwar growth was primarily due to Howard Hughes control over the carrier. However, by the mid 1950's TWA began to run into financial difficulties with its creditors as a result of Hughes purchasing aircraft that TWA could not afford to pay for. Hughes in his attempt to being TWA into the jet age had purchased over 130 Boeing 707 aircraft at a sum of 300 million dollars. This would have been a financial disaster for most air carriers for that time. Stockholder became very concerned, attempts by stockholders and management to reason with Hughes failed. Stockholders had filed lawsuits against Hughes for mismanagement of TWA. In 1961, TWA's stockholders won a victory through a court decision. Hughes was ordered to pay TWA 137 million dollars for damages. In a battle to gain control, TWA was back in court and in 1965, the court ordered Hughes to sell his shares of TWA. Hughes was paid over 500 million dollars his shares in TWA. 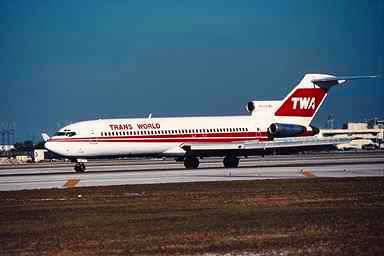 By the end of 1967, TWA was the first United States air carrier to become an all jet air carrier. By the Late 1980's, TWA was providing transpacific and round the world air services, initiated non-smoking sections in every aircraft in their fleet, introduced the 767 and the L-1011 into their fleet, acquires Ozark Airlines and had gone from a private air carrier to a public carrier in 1983.